There are few things more magical than a properly-prepared bath. Closing the bathroom door shuts out the world outside and magic can be accomplished soaking in a tub of luxuriously hot water. 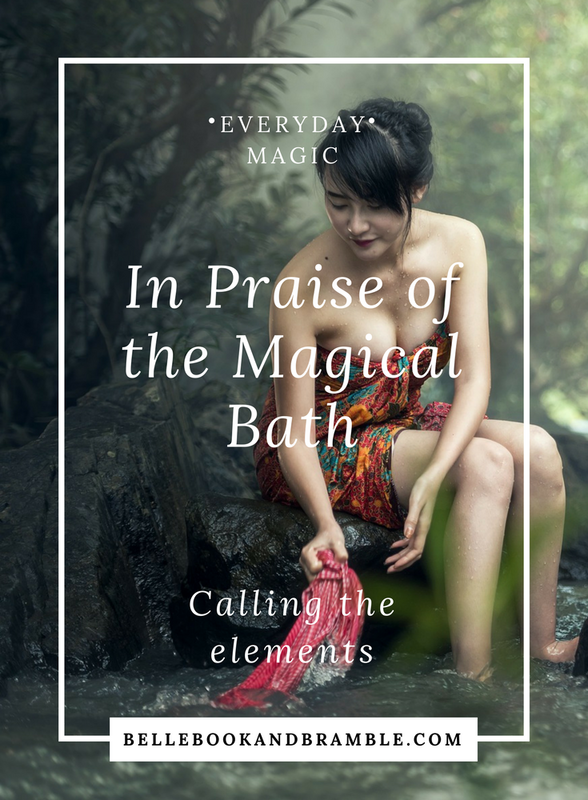 I find that it’s a good idea to include all the cardinal elements in the magical bath. Water is obviously present, to represent emotional current, flexibility, and purification. I add earth by throwing a handful of Epsom salts into the bath, and sometimes some water-safe stones or crystals at the bottom of the tub to enhance the vibration of the water. One of of my recent favorites is tumbled axinite. It’s said by metaphysical types to be an incredibly grounding stone, and enhances physical endurance. I was very ill awhile back, and I bathed in water with a handful of these stones every night. I still seek them out – they’re very reassuring in their vibration now, like old friends. Fire can be invited by lighting a candle. I have a lovely orange-clove jar candle burning for baths this time of year that seems appropriate for the season. And air can be honored by offering scent. I use essential oils for this purpose. Lately, I’ve been adding a few drops of bergamot and a few drops of sweet orange to the bath. The smell always puts a smile on my face. Sinking into a hot tub is a great time for visualization of the body, of imagining it to be in perfect health and all the warm muscles and blood and body systems working correctly and in harmony. It’s also a great time to gather wool about the future, to make plans and incubate creative ideas. The bath is an excellent time to feel purification energies, to get connect with goddesses of the water, like Oshun and Venus. I usually linger in the bath until it gets lukewarm, sigh, and get out. By the time the candle is ready to be blown out, I’m ready to go to sleep. The temperature drop after a hot bath will lull me to sleep faster than anything else, even the sweet-smelling bergamot. What kinds of things do you add to your baths to make them magical? I’ve heard about people adding herbs with cheesecloth, but I’m too worried about gunking up my pipes with herbal debris. I used some bentonite clay packs in the tub one time and quickly learned my lesson about that – only water goes down the drain. I haven’t tried bath fizzies, either, though those look really interesting. I’d love to hear what you think!